For all the appeal of Lord Huron’s elegiac, ethereal Americana, Fleet Foxes and Bon Iver were ahead of them in a very crowded field. So after two albums of hymnal beauty with acoustic guitars – and the track, The Night We Met, the Michigan band led by Ben Schneider have changed course. Now on a major label, the songs no longer conjure up vast rural or mountainous landscapes but the even more widescreen spaces of the cosmos. The title means “black void”, and vast swaths of reverb and echo (sculpted by Flaming Lips’ producer Dave Fridmann) create a celestial wall of sound; many of the songs have astral themes or metaphors. Writing on bass guitar has given the music a more powerful chassis, from Killers-like throb to subtle funk. Any remaining acoustic guitars have been blasted beyond recognition. With their first release on a major label, Los Angeles based band Lord Huron are more popular than ever. Their third album Vide Noir is beloved by critics and fans alike and we welcome them for a live set in the midst of a nationwide headlining tour. 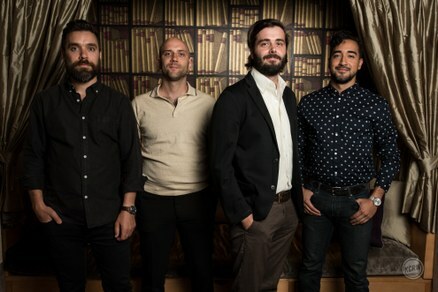 Lord Huron has morphed from the solo project of Ben Schneider to a full-fledged band and their sound has grown with it. It’s a bountiful collection of texture and rhythm from one of our favorite american bands.